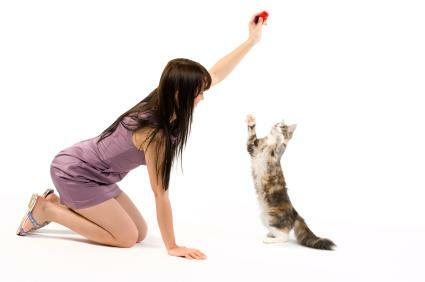 Clicker training is a method of training your cat based on reinforcing positive behaviors. According to many animal trainers, it is extremely effective. Studies done on multiple types of animals, including cats, have shown that clicker training can lead to successful elimination of unwanted behaviors, as well as introduction of new or wanted behaviors. How Does Cat Clicker Training Work? With clicker training, you can train your feline using positive reinforcement. It is simple to do, and you can begin at any time. Begin by associating the clicker noise with a treat. Do this by simply clicking your clicker and giving your cat a treat immediately afterward. Very soon, he will begin to hear the clicker and expect a treat. Next, choose a behavior that you'd like your animal to do. Immediately after she does the behavior, reward her with a click and then a treat. Soon, she will associate the behavior with a treat. Add a command to the routine of behavior, click, treat until your cat associates the command, with the behavior, click and treat. Once your cat is performing the behavior reliably, vary the amount of times he must perform the behavior in order to get the treat. Remember to associate the command, click and treat every time. Once your cat reliably performs a behavior, you can use that behavior to introduce other behaviors using the same target. Why use the clicker instead of saying "good kitty"? Your cat hears you speak all the time, sometimes in happy tones, sometimes in irritated tones, but speaking is nothing out of the ordinary to him. It's not likely to gain his attention at the precise moment of his actions the way the clicker will. The sound of the click is sharp and unique. It immediately grabs his attention, causing an instant association between his actions and the sound. Follow this immediately with a tasty treat or loving stroke and you've marked the occasion with a positive reward, something your cat will take to heart. Repeat these actions with the same positive behavior a few times, and your cat will begin to repeat the behavior because he understands he will be rewarded for it. Now you've got your cat thinking, rather than just reacting. You can use your clicker to replace your pet's unwanted behaviors with behaviors that you do want. If your cat is misbehaving in some way, offer him a physical distraction, and watch for a behavior you do want. Click, and reward him at the exact moment he does something good. When he doesn't receive a reward for his less than pleasant behaviors, he'll spend more time and energy on the actions that bring him a reward. The process takes some time, but it can work if you stay on top of the situation. Find a quiet location in which to begin. This is more likely to get your cat's attention the first time. Reward your cat for even attempting what it is you want him to do. This is called "shaping" his behavior and can take effect over time. Add a verbal cue for the behavior you want that you cat can associate in the future without the clicker. Clickertraining.com: Here you can find a wide selection of different clickers and accessories such as lanyards. The App Store: Download the app to your phone to train your cat anywhere. Physically punishing your cat for unwanted behaviors does not teach your pet anything but to fear you. Cat clicker training, however, can be a positive experience for you both. Gain your cat's trust and affection, while teaching him to behave in ways you can live with. Successful clicker training can help foster a better relationship between you both.